A radio show which explores sustainability gets to reasonably examine everything we do which affects sustainability. This includes a little citizen science comparing passenger car fuel efficiency, daily livability and cabin magnetic readings – which some say affect our overall health. After we sold our leased 2008 Honda Ridgeline, I took some time to shop other daily drivers. The Ridgeline was an excellent, reliable and comfortable truck created over Honda’s Pilot chassis. 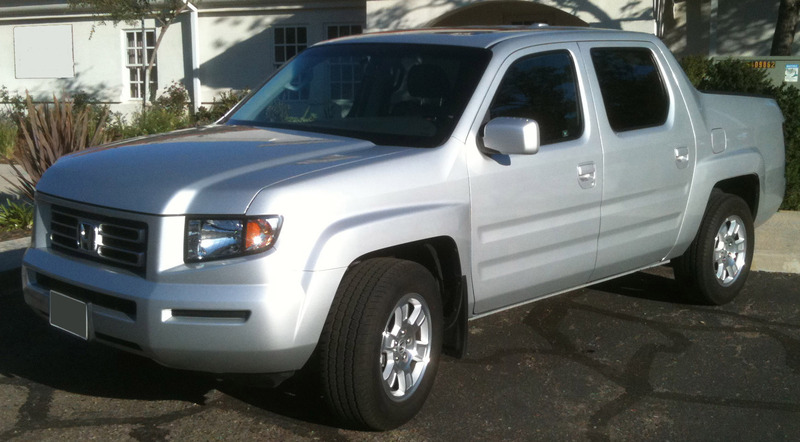 Although we very much enjoyed the Ridgeline, its poor mileage and thus energy use were – to me – unconscionable. 17 city miles per gallon’s not inspiring. For only one example, in Blue Planet Almanac’s second-ever broadcast, legendary biologist and planet doctor Tom Lovejoy reminded us that excessive energy use is our single biggest challenge in leaving a planet habitable for our children. Tom’s one of hundreds of millions of us who share this scientifically validated observation. Personally, I prefer to be less of an excuse for companies like BP to continue their destructive practices. Of course, it takes time and a little dedication to change anyone’s ways. I’m a good example of that, so I’m not here to bust anyone’s chops about the way they live. I still covet Ford’s fastest Mustangs, but don’t feel good about their energy use. Since 1996 I had owned two V8 Ford Mustangs. One at a time. The first was a leggy, black convertible in which I was known to fly low across Los Angeles’ freeways on Spring or Summer mornings (sometimes at 5 AM en route to work) with its top down. 18 or 19 city miles per gallon. The real reason I owned those fast V8s is that I love speed more than the average American; wind, air, road noise and adrenaline have always been my friends and I still relish every moment I find them. I eventually had to take my attraction for them to the racetrack so I could maintain my law-abiding ways. ;) God willing, I’ll return to the track in a completely race-prepped, dedicated track car. The second Mustang, a sea green coupe, was taken to Willow Springs International Raceway two months after I got it. It was later modified to handle the triple digit twisties of open-track driving events like those at Willow Springs, Las Vegas Motor Speedway or Fontana’s Auto Club Speedway. 18 city miles per gallon and 25 on the highway when I was a calm citizen. Although I never measured it carefully, on my quickest days at the track I would need to refuel after three, 15 to 20 minute sessions on a 2.4 mile track. I’d figure that was around 15 miles per gallon as fast as I could drive, and not including the tank of gas to get up and back to the track. After the Mustangs came a 2005 Pontiac GTO as my daily driver. Although it was faster in a straight line than my Mustangs, the GTO was too heavy for my favorite twisty tracks without extensive modifications. With it, I never set tire there. But the only thing for which I would have traded my commute down Pacific Coast Highway was to improve my child’s future on our endangered Earth. 16.9 city miles per gallon was what I’d get with my foot planted against the GTO’s firewall, and 19 when I drove serenely. With the mileage numbers of the Ridgeline, the two Mustangs and the cars we owned before that, came my strong interest in cars with newer designs. I was interested in either the best fuel mileage and thus least energy use, and electric cars. Around a month ago I started shopping hybrids and electrics in earnest. I’d become acquainted with the excellent folk of Plug In America at their Fifth Anniversary event. Through them I had a look at the Chevy Volt, the Nissan Leaf and other electrics before many of us. Although I liked the Leaf, its range is currently limited and it’s on the small side for six foot plus men. And I liked the Chevy Volt in many ways, except for its transparently opportunistic $41K base sticker price. Even with the $7,500 in tax advantages, Chevy wants at least $2,500 drive-off money to lease it for yourself. For many years we’ve preferred to put no money down on cars because they’re such phenomenally bad investments. No, thanks, Generous Motors. Wikipedia’s crowd-sourcing says the Prius was suspect and unsafe in some sections of its cabin for children and adults. It said that ICNIR had determined that levels of around 2 milligauss were safe for kids, but the Prius had considerably higher readings. Making a longer story short, I then noticed there were no references to EMF at Wikipedia’s page about the Honda Insight. This should make anyone suspicious; while there were criticisms on Wikipedia about the Prius, there were none about the Insight. Any electric or hybrid car should generate a measurable magnetic field: if criticisms would appear anywhere about anything, you’d figure they’d be on a less regulated site like Wikipedia. I eventually found many Web pages, including the New York Times’ article, “Fear, but Few Facts on Hybrid Risk,” most of which had largely unsupported opinions on the EMF being discussed. I made it a point to interview one of the men quoted in the article, Brian Collins. Brian was particularly helpful, unusually articulate and simply a nice guy. 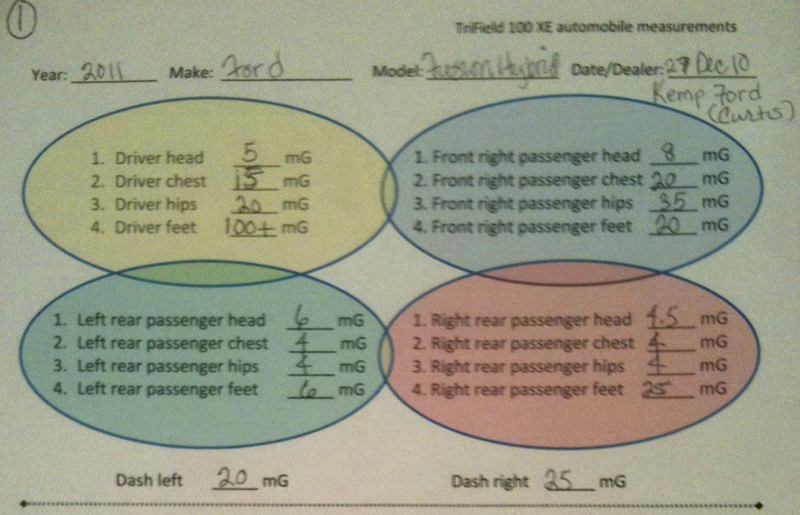 One particularly sensational Website even claimed the Prius’ right rear passenger seat metered at over 2,900 milligauss. Hhmmm, I said to myself – that’s alarming. And then I wondered if it were true. The milligauss is a thousandth of a Gauss and abbreviated mG. It’s a measurement of a magnetic field. In effect and affect, magnetism is usually considered non-ionizing. It’s nothing like the more dangerous microwaves from your oven or radio isotopes. People aren’t supposed to be able to sense magnetic fields and virtually all of us would never know they were nearby. But, at the same time, you have to remember that we’re not an animal species unaffected by magnetism, or there wouldn’t be agencies like the International Commission on Non-Ionizing Radiation Protection. In the United States, I couldn’t find convincing, clear agreement anywhere that higher levels of magnetism might be harmful. Most organizations, including the Union of Concerned Scientists explained that higher levels don’t matter. Many references from industrialized countries other than the U.S.A. suggested the magnetic fields from our cars, appliances and homes are far too high. But I still have this uncomfortable feeling that this situation resembles what scientists told us about tobacco until the 1950s. Obviously, a feeling’s not always verifiable in scientific fact, although I always pay attention to both. And except for my conversation with Brian Collins, no one I talked or corresponded with had information I felt I could trust. 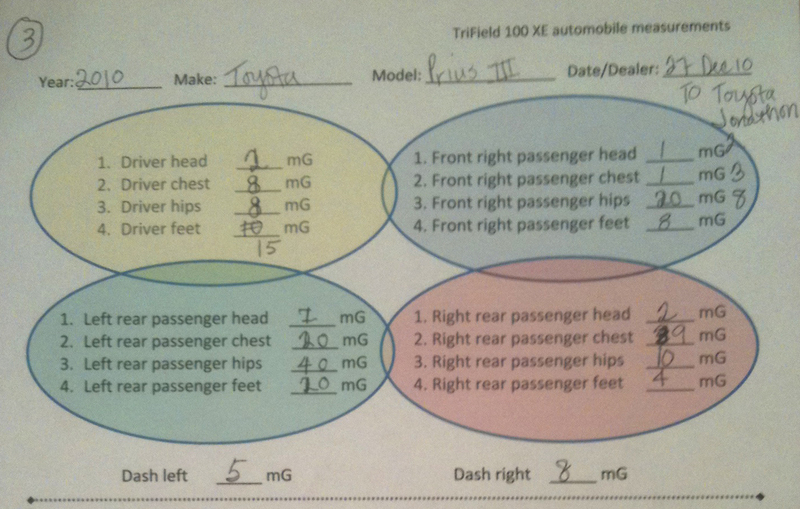 Making my way through hundreds of Web pages, including the particularly inhospitable and cronyistic PriusChat forum, I eventually decided the only way I’d get good, inexpensive information about mG readings from the Prius or any other car was if I measured the cars myself. This all boils down to whether or not you trust an automobile manufacturer, your government and the people on their payroll to always look out for your health and best interests. I don’t. Toyota just got itself into the largest recall on the automotive industry’s records with its spin on the truth. Compare, “We’re from the government, and we’re here to help” with “We’re from the company, and we’re here to help,” and see how you feel about those. Whenever anyone, no matter their credentials, says they’re on a government or corporate payroll, it’s smart to compare their facts with other objective opinions you can find on your own. You can do the same for many millions of verifiable reasons, but your choice is always yours. So I popped over to Fry’s Electronics, got a TriField 100 XE meter, and started test-driving new cars. Below are my results. Now, remember, I wouldn’t consider this to be useful in a scientific sense. I did quick readings which allowed me to make a personal choice how I spend my money, time and health. Yet I’d sooner trust the combination of my results with a manufacturer’s or government’s any day – rather than rely solely upon their written or spoken word. 1. 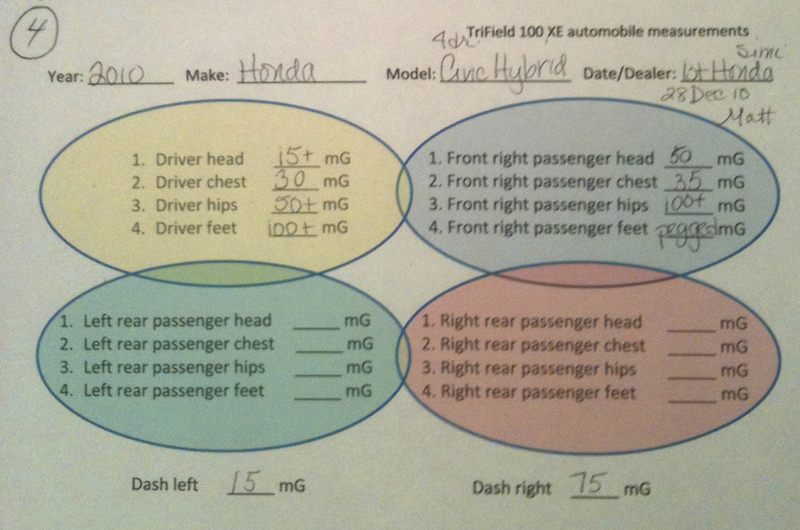 Honda’s 2010 Civic Hybrid had readings high enough that I opted not to further consider their cars. 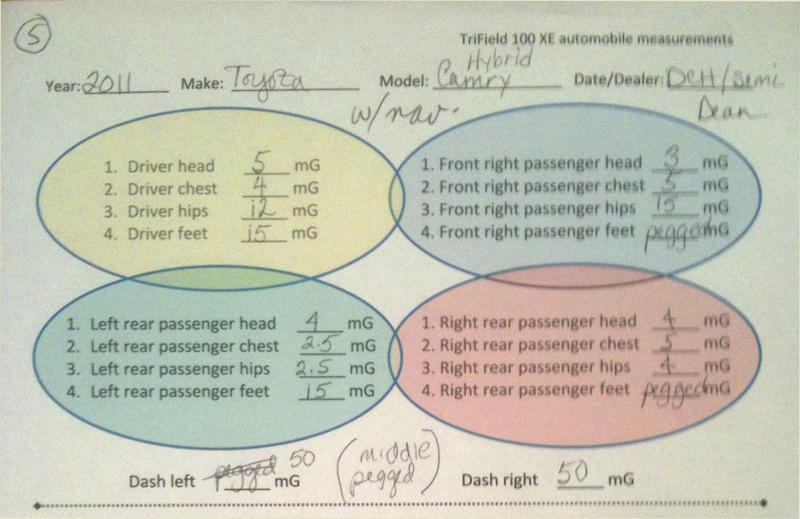 Several areas in the cabin exceeded 50 mG or 100 mG – so high I stopped testing them and just moved on to the next car because I didn’t feel any strongly positive emotion about their styling, mileage or image. They don’t possess the irresistable seduction of a rumbling, throaty, powerful V8. This was also in the context that Brian Collins had conclusive testing done on his 2000 Honda Insight by experienced electrical industry practitioners. They commented to him that they would prefer not to ride in the car because its readings were so high. 3. Ford’s 2010 Fusion Hybrid became the car on which I’d eventually settled. I think they look O.K. and they’re slightly bigger than a Prius. 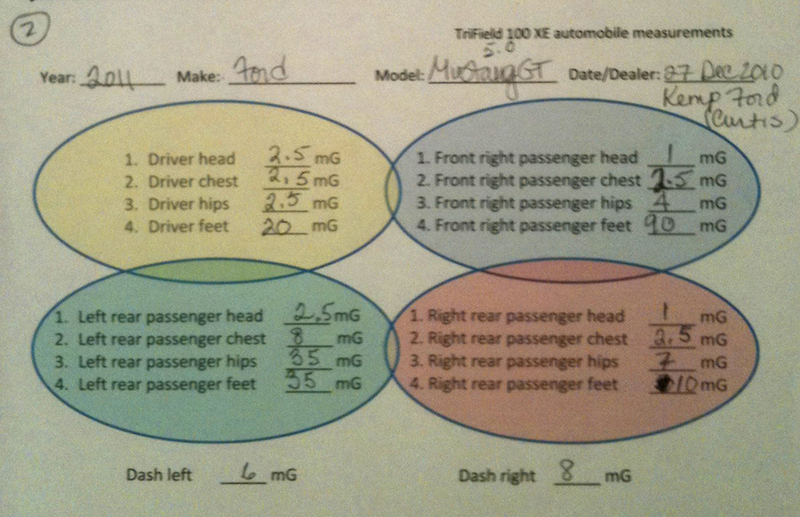 Testing on the TriField 100 XE meter of Ford’s 2011 Fusion Hybrid was acceptable to me. Then I discovered that Ford was banking on the fact you’d purchase it at sticker price. Ford had only disadvantageous lease deals, and valued the 2011 Fusion’s residual at only 43%, while Toyota and Honda appraise them at well north of 50%. Because of this Ford won’t even consider leasing you a 2010. What finally turned me away was that our dealer’s sales manager tried to talk us into a Mazda’s gasoline engine numbers. I was shopping hybrids. No, thanks. Next. 5. Toyota’s 2010 Prius had the lowest readings of all the cars I tested, even with its invasive center console, navigation system, audio upgrade and moonroof. Surprise! After all the thin-skinned baloney I had read on the Web about the Prius, none of its naysayers provided any simple science that its electrical fields are any higher than the common cars I tested. Might you think Toyota anticipated people like me given the content of the Wikipedia page, or even their recently deserved press about having the Earth’s largest-ever automotive safety recall? Maybe. But I’d doubt that. Remember that the U.S. government’s and manufacturer’s stories are that these cars tested safely with a vastly more thorough and accurate process than the one I used. Now, some quick mileage math for us, considering that my choice for this purchase and article was to balance energy use with a daily driver’s livability. The sticker on the 2010 Prius quotes 51 city and 48 highway MPG. Compare that with my slightly modified 1997 Mustang Cobra’s highway mileage of 25 without my foot buried in its engine. The Cobra’s mileage would dip to 21 when driven enthusiastically on the highway. The Prius achieves nearly twice either mileage figure. If you used the 2005 GTO’s 23 MPG on the road, again it’s over twice the mileage. Now, take the GTO’s lower city mileage limit with my foot planted, which was 17 MPG. 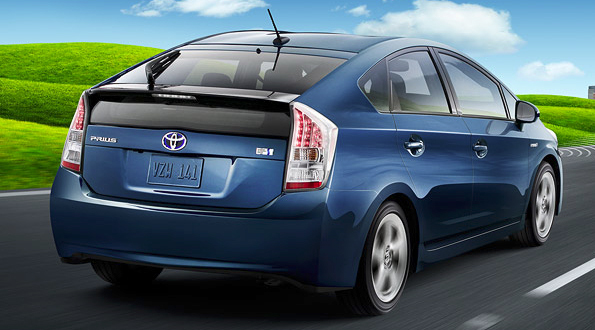 The 2010 Prius’ sticker quotes 43 MPG as its expected lower limit. That’s 2.5 times the mileage of the worst city MPG of the 2005 GTO. My current choice for personal urban transport. By now you’ve guessed what kind of car I bought on New Year’s Eve of 2011. No, Toyota’s not paying me. I’ve paid them to own the car they made. Personally, I even think they’re absolutely fugly compared to most other cars on the road. Its seat fabrics, headliners and interior are overly inexpensive. But this car’s about the condition in which I’d prefer to bequeath the Earth to my child. So, I’m especially happy with it because we cut an awesome deal on what the Union of Concerned Scientists says is most fuel-efficient hybrid on the road.